It seems every foreigner sings along to the now famous Pattaya Pattaya song and with good reason. It’s catchy. It’s cheekily memorable with it’s Thai phrases and it happens to mention a good few watering holes in and around town. It may be a local classic but it’s also outdated. 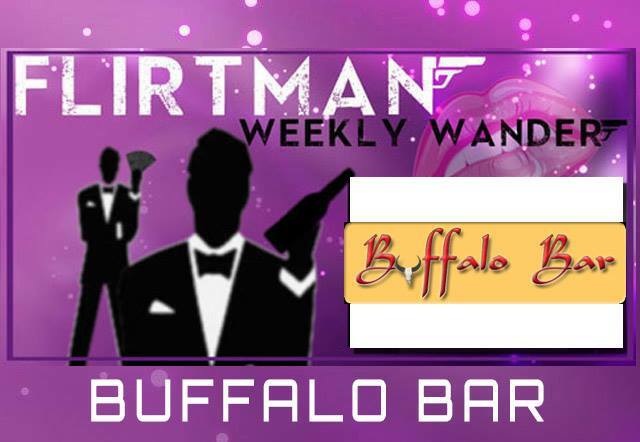 Hollywood has relocated long ago (and not a shadow of it’s former self), Marine Bar is too dark to see anything, X-Zite has been bulldozed…so FlirtMan just had to go to the remaining Buffalo Bar and see if he was welcome. This long thin bar is located just off thrid rd opposite Soi Lengkee and is a strange layout in so far as it’s not quite an outdoor bar but not quite an inside one either. If you look closely you’ll see the walls are actually just bamboo garden fencing so if there is any street noise or outside smells…you’ll get it in the bar too. Trying to pidgeon-hole the bar is difficult too. The front entrance is a stoney waterfall garden theme with square bar and stools but move inside and it turns into a high table area complete with mirrored gogo pole stages. Venture further and it becomes a pool sports lounge. Go figure. Obviously Flirtman is more interested in the gogo area as it lends an element of entertainment when doing a lone tour-of-duty as is the case on these Weekly Wanders. Whilst there certainly is a decent rotation of dancers and twerking to a very high gogo standard, it’s unclear whether these girls are regular salaried girls or come-and-go freelancers. You may come in and wait 20 mins to see a shuffle or spin or it might be continuous wall to wall gyrating hotpants. Who knows. Music wise we have a slightly over the top volume setting which can make conversation difficult especially near the speakers and there are a few flat screen Tv’s showing non-descript sports coverage to add to the general theme confusion. When it comes to drink prices the popular Buffalo Bar is surprisingly affordable with Singha/Tiger starting at 75baht and San Mig rising to 90 baht. Ok nothing special there but hold on, Lady drinks come in at a super price point of only 90 baht. The girls are polite without being over-bearing although beware of the more intoxicated ones as they tend to lay claim on customers and start to kick off internal staff fights if the mongers change the damsel of their choice. Nothing a small chat to the mamasan cant sort out but maybe you’ll get a boxing show in and around the ladies toilets free of charge.